At the beginning of the year, Almanac Brewing opened its first tap room: a bar and restaurant hybrid located in San Francisco’s Mission District which (lucky for me) just happens to be my neighborhood. I missed it opening weekend, but visited a few weeks later with some friends and fell in love with Nectarine Cobbler, a taproom exclusive that is probably best described as a slice of pie in a glass. It is absolutely delicious. It’s also a mistake. I can’t remember the story behind it (probably due in part to the number of them I had during our visit), but the spiced brew was created after something went wrong with another beer, the Almanac Farmers Reserve Nectarine. 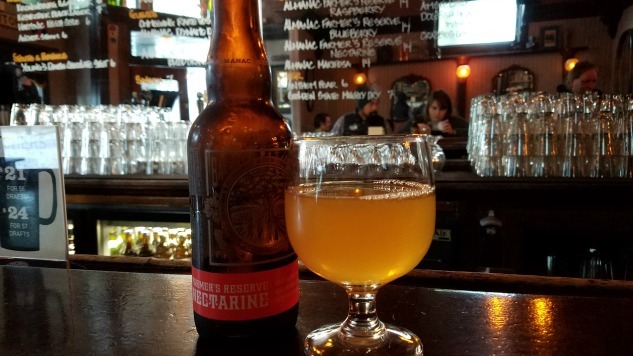 Fast forward a few weeks, and my boyfriend and I happened to hit up another local bar that had the Nectarine available. Unlike my Cobbler love, this one is bottled and distributed, so you can find it places outside of the brewery and taproom. We grabbed a bottle and gave it a try. To make the beer, Almanac added nectarines to a sour base beer. The wild ale was aged in wine casks and pours a light orange. The brew has hints of tangerine and meyer lemon on the nose and is a beautifully balanced sour with tart nectarine, and a dry, slightly funky finish. While, in my humble opinion, it didn’t quite live up to the Nectarine Cobbler, it’s still pretty awesome and definitely worth picking up if you’re out and about looking for a great sour. The beer is designed to be something you can drink now, but that should also age well.